Arctic is a polar region located at the northernmost part of the Earth, consisting of Arctic Ocean and parts of Canada, Russia, the United States (Alaska), Denmark (Greenland), Norway, Sweden, Finland, and Iceland. The Arctic region consists of a vast, ice-covered ocean, surrounded by treeless permafrost. 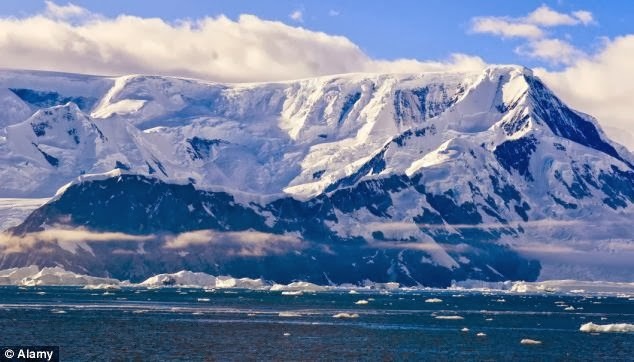 The other polar region is - Antarctica on the Earth's southernmost continent, containing the geographic South Pole, surrounded by the Southern Ocean. There are no permanent human residents here, but anywhere from 1,000 to 5,000 people reside throughout the year at the research stations scattered across the continent. Chennai, the capital of Tamilnadu on the Coromandel coast is experiencing chill weather. The month of Margazhi would be born in another 5 days… Margazhi is a cold month – where you experience cold weather and mist in the mornings…. It is the month of Carnatic music too. November (the tamil month of Aippaisi) is supposed to be the rainiest month in Chennai as the state receives more than 50% of its annual rainfall from the northeast monsoon. Formation of a series of low pressure system in the Bay of Bengal which turn into possible cyclones is the major reason for the rainy weather in the city during winter months (Oct - Dec). We have been hearing to too many cyclone names – not much of rain though…. And in the weekend that went past, city residents woke up to a windy Saturday and several areas experienced light rain, thanks to the severe cyclonic storm, Madi lying over southwest Bay of Bengal, about 500 km southeast of Chennai. While Ennore received two cm of rainfall, the weather observatories in Nungambakkam and Meenambakkam recorded around one cm until 83.0 p.m. on Saturday. Madi, the name given by Maldives, is expected to be active for three or four days after which it may weaken. Madi is the fifth system formed over the Bay of Bengal this season, since October, still have not contributed much to city’s reservoirs. It would make Britain's recent cold weather seem like a heatwave. Scientists have discovered the coldest place on Earth - where the air temperature plummets to below -91C. The newly-found spot - situated along an Antarctic mountain ridge - could freeze a human's eyes, nose and lungs within minutes. This is because its temperature is almost 13 degrees below the point at which CO2 transforms from a gas into dry ice (-78.5C). The record-breaking discovery was made by researchers from America's National Snow and Ice Data Centre, according to The Sunday Times. They used satellites and other techniques to measure temperatures in Antarctica. The -91.2C spot - one of numerous cold places recorded on the mountain ridge - is believed to have been found at heights of more than 12,400ft on a mountain called Dome Fuji. Astonishingly, it is even chillier than Russia's Vostok research station, where the world's previous coldest air temperature (-89.2C) was recorded during the Antarctic winter of 1983. 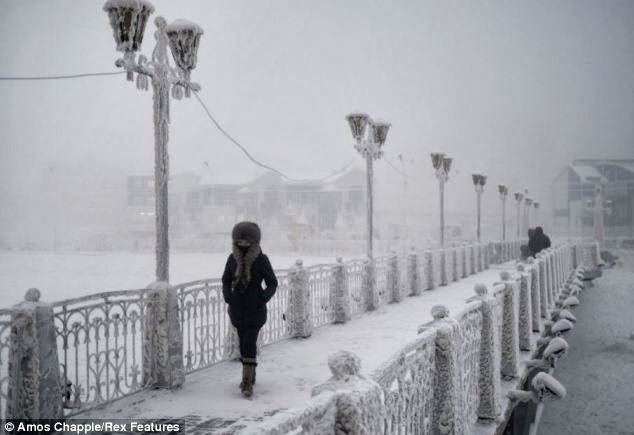 Earlier this year, the Russian village of Oymyakon was revealed to be the coldest permanently inhabited settlement in the world - with the average temperature for January standing at -50C. The village, which is home to around 500 people, was, in the 1920s and 1930s, a stopover for reindeer herders who would water their flocks from the thermal spring. In comparison, the coldest temperature Britain has ever seen is -27.2C, which was recorded in 1995 at Altnaharra in the Scottish Highlands. Before concluding – a news report of NBC News asks you to try 135.8 degrees Fahrenheit below zero; that's 93.2 degrees below zero Celsius, which sounds only slightly toastier. Better yet, don't try it. That's so cold scientists say it hurts to breathe. A new look at NASA satellite data revealed that Earth set a new record for coldest temperature recorded. It happened in August 2010 when it hit -135.8 degrees. Then on July 31 of this year, it came close again: -135.3 degrees. Ice scientist Ted Scambos at the National Snow and Ice Data Center said the new record is "50 degrees colder than anything that has ever been seen in Alaska or Siberia or certainly North Dakota." "It's more like you'd see on Mars on a nice summer day in the poles," Scambos said, from the American Geophysical Union scientific meeting in San Francisco. However, it won't be in the Guinness Book of World Records because these were measured by satellite, and not from thermometers at ground level, Scambos added. How about a shower in chill water and do you cover yourself with blankets when you sleep ?